Citizen Soldier - BUY THIS BLU-RY! 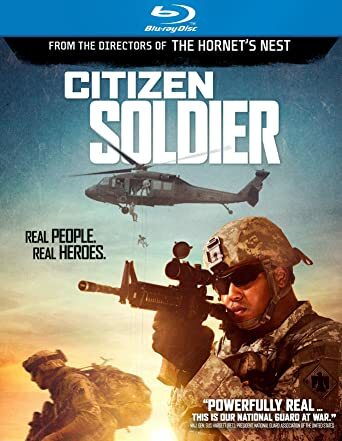 CITIZEN SOLDIER is a dramatic feature film, told from the point of view of a group of Soldiers in the Oklahoma Army National Guard's 45th Infantry Brigade Combat Team, known since World War II as the "Thunderbirds." Set in one of the most dangerous parts of Afghanistan at the height of the surge, it is a heart-pounding, heartfelt grunts' eye-view of the war. A modern day Band of Brothers, Citizen Soldier tells the true story of a group of young Soldiers and their life-changing tour of duty in Afghanistan, offering an excruciatingly personal look into modern warfare, brotherhood, and patriotism. THEN SEND IN A COMMENT ABOUT YOUR FAVORITE FUNIMATION TITLE (you may click on artwork above for a refresher) PLUS YOUR NAME AND ADDRESS TO contests@efilmcritic.com or WeLoveHBS@aol.com. (Just one e-mail please.) Put [b]"THUNDERBIRDS ARE GO!" in the subject line and cross your fingers. We will draw names and one of the prizes could be yours. Only 1 entry per household.